Ready, set, go! This weekend we kicked off our first Fresh Grounded Faith event of 2019 in Augusta, Georgia. Thank you to Taylor Sakata for the beautiful photos. To see the entire Facebook photo album, click here. For those of you who joined the photo booth fun, you can view your photos here. Oh, girl, they were ready when we got there. These women were on fire. They were so full of life and love and I felt like it was a family reunion with women I just met. They had set every detail for a great weekend and we did go for it! We laughed, worshipped, learned what it means to be unshakeable, and made tons of new friends. It was wonderful to have Laura Story, Karen Abercrombie, and Shaun Groves with us again! Laura’s messages and music on stage are powerful and effective, yet the message she preaches off stage through her kids compassion and delight is equally as powerful and effective. Karen, Miss Clara from War Room, brought down the house as usual. These Augusta women were big-time Miss Clara fans and it’s easy to see why. Karen is so effective in everything she does. Shaun Groves moved us to worship all weekend and he moved our hearts with his incredible storytelling. Seriously, this team blows me away! And, we are so very grateful to Abilene Baptist Church and the co-host churches for welcoming us and making us feel at home! Our Local Conference Coordinator Kileigh Jones and all of the sweet volunteers made us feel so loved! We had 26 men and women on the security team alone. And, every time we turned a corner, we would meet a team leader who would say, “Are you okay? Can I get you anything?” Such servant-led people! God did great things this weekend. We celebrated 5 new sisters in Christ, 38 women who chose to renew their commitment to the Lord, and 88 children sponsored through Compassion International. Thank you, Jesus, for the decisions and the tremendous response of children being rescued from poverty! What a blessing our time in Augusta was! Friends, my heart is full! Were you with us in Augusta? Please share your favorite part of the weekend in the comments below. Would you like to attend a Fresh Grounded Faith conference? Or, bring one to your city? Click on the buttons below to find out more information. Find a Fresh Grounded Faith event near you. Bring Fresh Grounded Faith to your city. FGF Springfield, IL jump started a richer and better community of churches united as the BODY OF CHRIST when we invited over 10 Co-Host Churches to join us for an amazing weekend experience. FGF is well organized and supports the host church with an amazing FGF team! I could never have predicted the way that Fresh Grounded Faith would impact our faith community. The conference far exceeded any expectation that we had going in. It was well-organized from day 1 of the planning all the way to the weekend of the conference, and every single interaction with Terrie Bitter and the other FGF staff was filled with grace and love. OH. MY. GOODNESS. Fresh Grounded Faith was so much more than a conference. FGF was a gift to us and our local churches. Volunteer teams from so many different churches became friends and worked together with laughter and hugs and they just really meshed together in Jesus' name to prepare this place for God to move... and HE DID. Beautiful things unfolded and there are just no words to describe it. This is a team truly serving and honoring God. I continue to be overwhelmed by God's goodness, His faithfulness, His provision. I have never encountered a better organized and prepared event...you are amazing. Each team lead and every person on our staff were very blessed to serve with FGF and you. Every woman I saw, in some way or another, conveyed that this was the very best women's event they have ever attended. After several years of hosting women's events within our church, we felt God leading us to reach out beyond our local community, but did not know where to begin. From the moment we learned about FGF, I knew they had the vision and experience to enable us to expand our ministry. 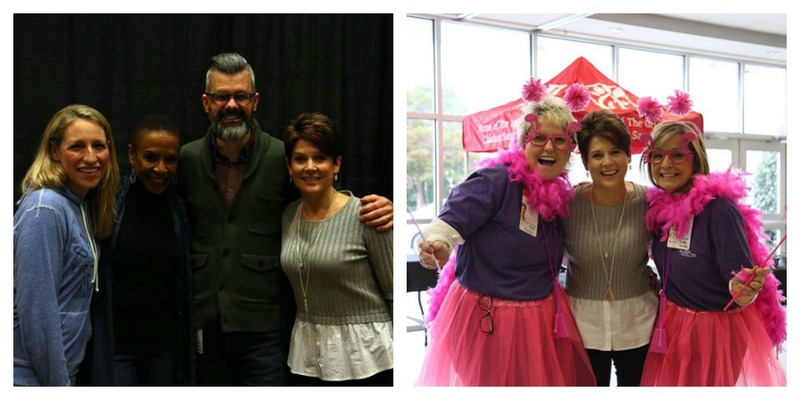 One of the biggest blessings of our relationship with FGF was the ability to partner with other churches in our region, who shared the common bonds of loving God, studying His Word, and being inspired by the Spirit filled teaching of Jennifer Rothschild. We honor God and serve women through Christ-centered, life-transforming content, events and services. We have four values that ground us and guide us. These four culture markers help us “rise” to fulfill our mission and reach our vision. Relationship with God, relationship with each other and relationship with the women we serve are our priorities. Everything we do has an impact. Our attitudes and actions influence others, the overall culture of the ministry and the lives of those we serve. We don’t own our gifts or this ministry, we are stewards. God is our ultimate Master. Stewardship means we take our work seriously, grow and improve; learn and change as needed to honor God. We give 100% in whatever we do. We reject perfectionism yet we don’t settle for mediocrity or mistakes. At the young age of fifteen, Jennifer was diagnosed with a rare, degenerative eye disease that would eventually steal her sight. It was more than a turning point for the Miami, Fl, native. Her dreams of becoming a commercial artist and cartoonist faded. Words and music have replaced her canvas and palette for more than 25 years. Jennifer travels the country offering fresh, sensible, Biblical advice to audiences who, like her, are determined to pursue healthy and productive lives. Jennifer has shared her inspiring message to the arena-sized audiences of the popular Women of Faith conferences, and media outlets including Dr. Phil, Good Morning America, Life Today, and The Billy Graham Television Special. If you are looking for fresh grounded faith, pull up a chair and have a little java with Jennifer. ©2019 Jennifer Rothschild. Powered by the Get Noticed! Theme.